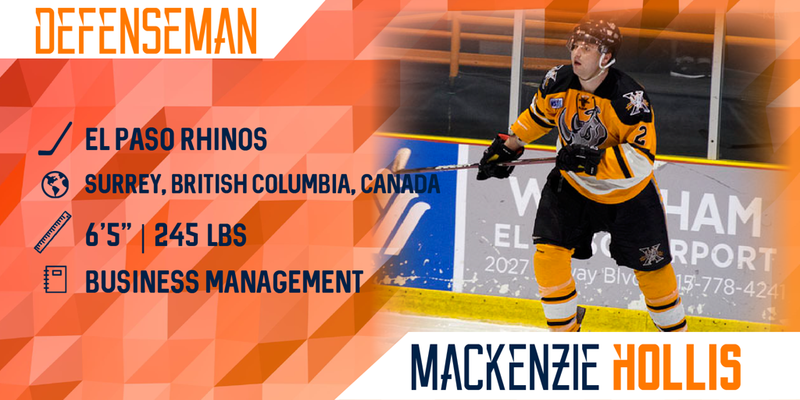 Join us in welcoming the newest addition to the Miners Hockey Club roster, incoming freshman Mackenzie Hollis from Surrey, British Columbia, Canada. “Mack will help a lot on our back end. He’s a big defenseman that can also play forward when called upon. His physical presence will open up a lot of ice. He's a great team guy and will see a lot of ice time in different key situations,” notes Coach Herman on the addition of Hollis to the Miner roster. Why did you choose UTEP? I chose UTEP because I love El Paso I have lived there for the past two years playing hockey, the passionate fans, great coaching staff and excellent education is was a no brainer to choose UTEP. What are you looking forward to most about coming to UTEP? I'm looking forward to UTEP because I'm excited to start my college hockey career as well as experience the collage lifestyle. What has been your favorite moment of your hockey career so far? My favorite hockey moment would be coming out of our locker room for my first home game in El Paso and seeing the atmosphere that the fans bring to the city. When did you start playing the game of hockey? I started playing hockey around the age of 4 or 5 and have loved the game ever since. Which NHL player(s) do you model your game after? I model my game style after Chris Pronger, I loved his intense toughness he brought to the ice every game. What is your favorite activity outside of hockey? My favorite activity outside of hockey would be fishing. As well as quading, being out in the country in general is my favorite pastime. Season Tickets are on sale now! Click here for more information.